Global variables can be used to get data from a HDevelop procedure while it is running in the HDevEngine. In this article, we explain how this can be done in a C++ project on Windows. The example creates a new C++ console application from scratch and shows how global variables can be used to show log messages from a HDevelop procedure running in the background. For this project I used Microsoft Visual Studio 2017 Community Edition. We assume HALCON 13 is your default installation. If not, you can change the default HALCON version with our tool Start Center for HALCON. In Solution Explorer, right click on the project "HDevEngineGlobVar" and select Properties in the context menu. Make sure you have selected the same platform in this dialog (e.g. x64) as in the run configuration (as seen in the Visual Studio main window toolbar). ** TestProc will run for 5 seconds. We recommend to not use the precompiled headers option: Remove the stdfx.h, stdfx.cpp, and * targetver.h* files from your project In the project properties, go to C/C++ / Precompiled Headers and set Precompiled Header to Not Using Precompiled Headers. // global variable GlobalLog. 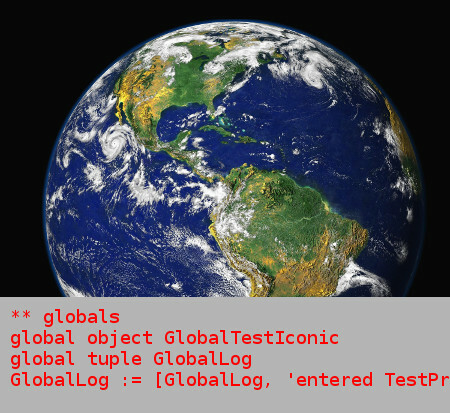 GlobalLog is updated in TestProc procedure. std::cout << "number of objects in GlobalTestIconic: "
Note that HDevEngine global variables can only be created by the HDevEngine via scripting code in the loaded scripts or procedures. As far as I know, there is no way to create globals (e.g. before loading single procedures) from C++ code. When the program is run, it runs the HDevelop procedure TestProc in the background, while showing the log output in the main thread. When the TestProc finishes execution, the main thread will continue and in this example the program ends.